Project : Supply of Equipment & materials and inland transportation, insurance, unloading, handling, storage at site, erection, testing and commissioning of all equipment and materials for Rural Electrification works in KORBA District of Chhattisgarh on Turnkey basis. Client : NTPC Electric Supply Company Limited. Project : Supply of Equipment & materials and inland transportation, insurance, unloading, handling, storage at site, erection, testing and commissioning of all equipment and materials for Rural Electrification works in BILASPUR District of Chhattisgarh on Turnkey basis. Project : Supply of Equipment & materials and inland transportation, insurance, unloading, handling, storage at site, erection, testing and commissioning of all equipment and materials for Rural Electrification works in GUNA District of Madhya Pradesh on Turnkey basis. 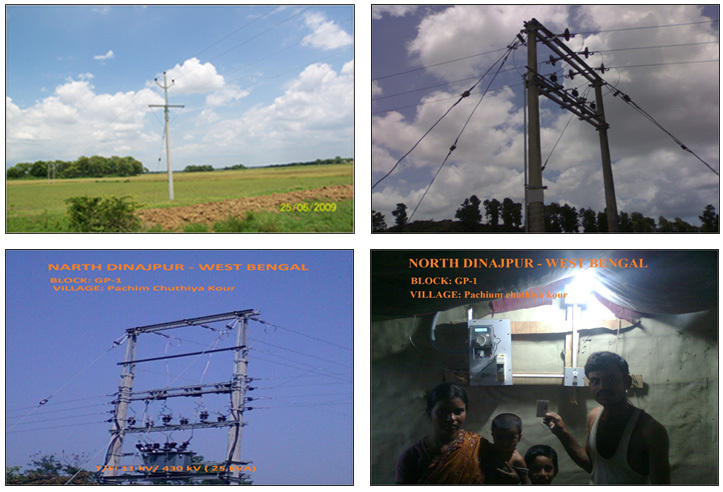 Project : Rural Electrification work under RGGVY Scheme in LATEHAR District of Jharkhand covered by Package-E on Turnkey contract basis. Client : Jharkhand State Electricity Board. Project : Rural Electrification work under RGGVY Scheme in GARHWA District of Jharkhand covered by Package-F on Turnkey contract basis. Project : Rural Electrification work under RGGVY Scheme in PALAMAU District of Jharkhand covered by Package-G on Turnkey contract basis.